Part of the history and mission of Resource Center is our education and advocacy. Our impact reaches far and wide. For example, more than 50,000 individuals are covered by workplace policies and over 230,000 students by school policies that protect LGBTQ employees and students, due to our advocacy efforts. We have established strong working relationships from the City of Dallas and Dallas Independent School District to the North Texas Tollway Authority. This month, Resource Center is supporting “All In for Equality Advocacy Day,” and joining Equality Texas and other organizations at the state capital. Make your voice heard with elected officials as hundreds of people travel March 20th to Austin. Buses are filling up now, so reserve your spot here. Read other information below and follow us at Facebook and Twitter for more information and updates on legislative issues. Legislation has been filed that would prohibit transgender persons from access to restrooms that match their gender identity (Senate Bill 6 and House Bill 1362). On a positive note, a bill has been filed to provide information about PrEP and PEP to persons getting tested for HIV. Let your elected officials know where you stand. 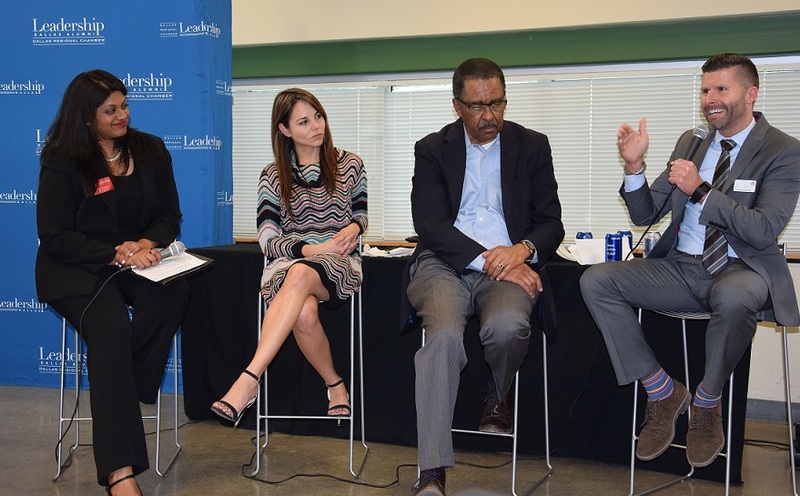 Youth First’s Program Manager, Johnny Humphrey, served on a panel at Leadership Dallas’s “Human Services Day,” on February 3. The panel, which included Charles English, President & CEO for Boys & Girls Clubs of Greater Dallas and Diana Ayala, Outreach Manager for NTX Alliance to Reduce Unintended Pregnancy in Teens, discussed a variety of factors causing teenage poverty and homelessness. 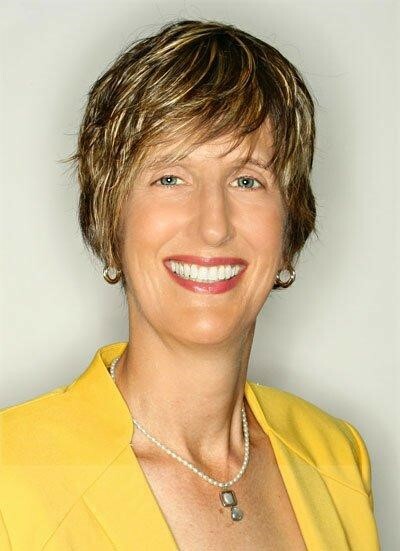 “It was a privilege addressing the challenges that too many LGBTQ youth face in areas of discrimination, neglect and violence at home, in schools and within communities, that often lead to poverty and homelessness, to such a large group of business and community leaders,” Humphrey stated. Leadership Dallas is the Dallas Regional Chamber’s flagship leadership development program, aimed at providing our city with an ongoing source of diverse leaders who are prepared and committed to serve as catalysts and sustainers of positive change for the quality of life in the greater Dallas area. Women With Pride is a program of Resource Center, dedicated to empowering LGBTQ women through community involvement and social opportunities. With a focus on increasing the well-being of each participant, a Lesbian Fiction Book​ Club meets each month to discuss an assigned book with the unique opportunity to have a guest author participate, either in person or by web cam. 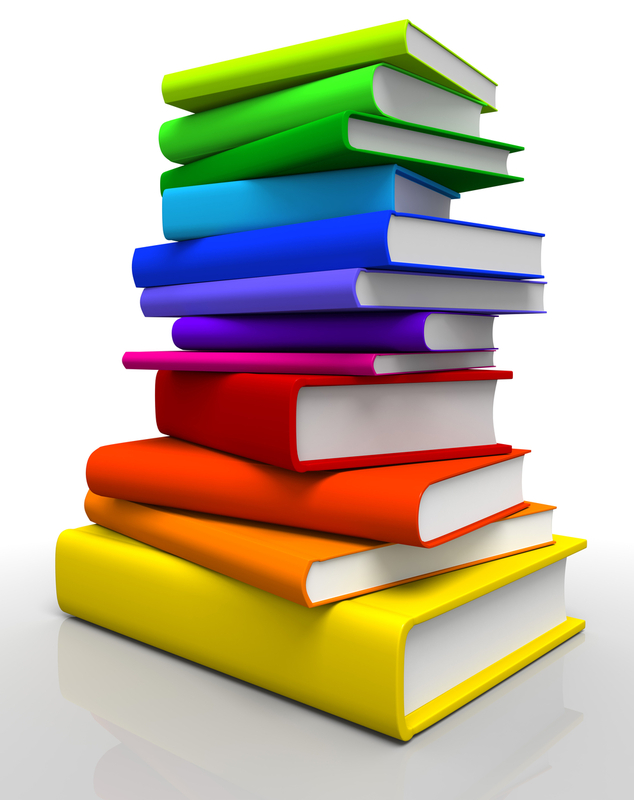 The group also conducts book swaps to support the club. Readers may leave and take a book or buy a copy for $2. State Representative Rafael Anchia has filed HB 2006, a bill to provide specific prevention measures to people who receive a negative HIV test, including pre-exposure (PrEP) and post-exposure prophylaxis (PEP). PrEP is a broad prevention strategy including HIV-negative individuals taking a daily medication to reduce their risk of becoming infected. PrEP has been shown to be up to 99% effective at preventing HIV transmission. 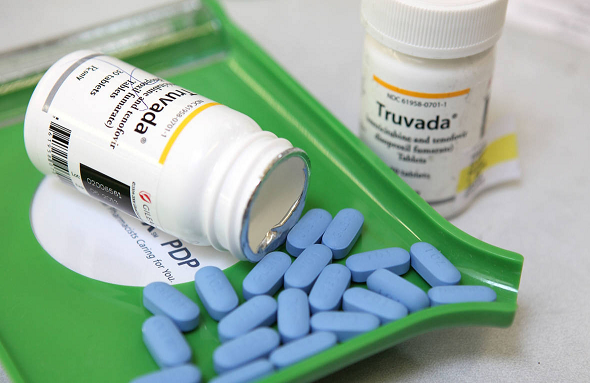 PEP involves taking anti-HIV medications as soon as possible after a potential exposure to reduce the risk of becoming HIV-positive. Studies have shown that PrEP & PEP awareness is low in what medical officials categorize as high-risk groups, including but not limited to Black and Latinx gay and bisexual men. Over the past several months, Resource Center worked closely with Representative Anchia’s office on the language of the bill, and as a longtime advocate on issues surrounding HIV the Center strongly supports the measure. The bill is good public health policy because it gets additional HIV/AIDS prevention information into the hands of people who can benefit from it the most. It also encourages patients and medical providers to frankly and openly discuss issues related to sexual health. As the bill moves forward, the Center will provide updates on ways you can support this bill. GET ON THE BUS MARCH 20! Join Resource Center and other LGBTQA organizations from across North Texas to take part in “All In For Equality Advocacy Day” in Austin. Buses leave at 7:30 AM from Cathedral of Hope (Cedar Springs @ Inwood Rd). En​ route, you'll receive education on LGBT advocacy over breakfast. When we get to Austin, we'll join with other LGBTQA advocates from across Texas to visit the offices of our state representatives and senators. On the way back, enjoy snacks on the bus. Attendees should be home in DFW around 7 p.m.
Don't miss this empowering event to make your voice heard. There is a nominal $15 donation to help cover costs, but nobody will be turned away for inability to pay. Please register for transportation at www.galantx.org/event-tickets. 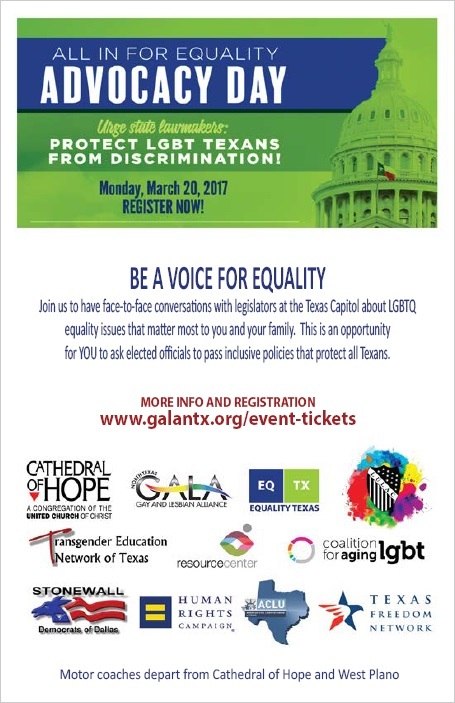 Advocacy Day sponsors include: Equality Texas, Human Rights Campaign, ACLU Texas, Texas Freedom Network, Transgender Education Network of Texas, Cathedral of Hope, Coalition for Aging LGBT, Stonewall Democrats, LULAC, GALA North Texas and Resource Center. Resource Center provides needed nutritional support to people living with HIV/AIDS with food distributed through the health campus food pantry and weekday lunch program. 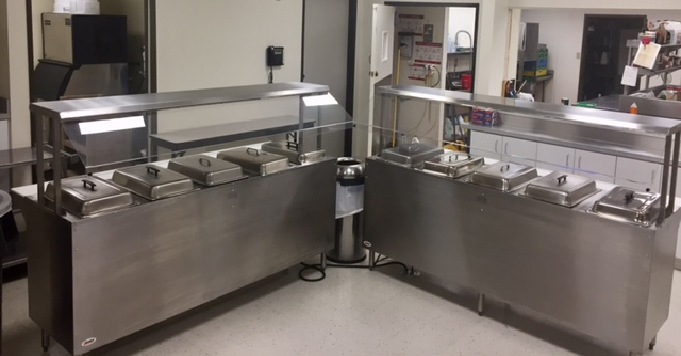 The newly remodeled health campus was unveiled this past November and because of the generous donation of two new food islands, one hot and one cold, clients may improve their quality of life with healthy diet options. The anonymous donor, who is a longtime Resource Center volunteer, said he has been blessed to share some money and wanted to help the clients he assists every day. "Some people don’t like the limelight, but they do want what is best for our clients," said Dale McEowen, program manager of the health campus. If you are interested in making a donation to the health campus, please click here for more information. Justin Densmore, program chef at the Center's health campus recently won Best Casserole at the Dallas Bears Second Annual Casserole Cook-Off. In addition to creating award-winning recipes, Justin develops the menu for the Center's health​ campus hot meals program which provides eligible clients one meal each weekday, five days per week. On average, the program serves 600 meals per week. Meals are designed to provide one-third to one-half of daily nutritional needs and menus are planned specifically to address the caloric needs of individuals impacted by HIV/AIDS. Justin says, "Planning nutritious meals doesn't have to be boring. For our clients, food is medicine. I like challenging myself to create menus that are diverse, delicious and healthy. Fortunately, this isn't difficult to do because of the incredible donations we receive on a daily and weekly basis. With the help of our volunteers we are able to serve food that some of our clients have never tasted or even heard of. These meals not only to meet the nutritional needs of the Center's clients but hopefully broaden their horizons as well as their palates." 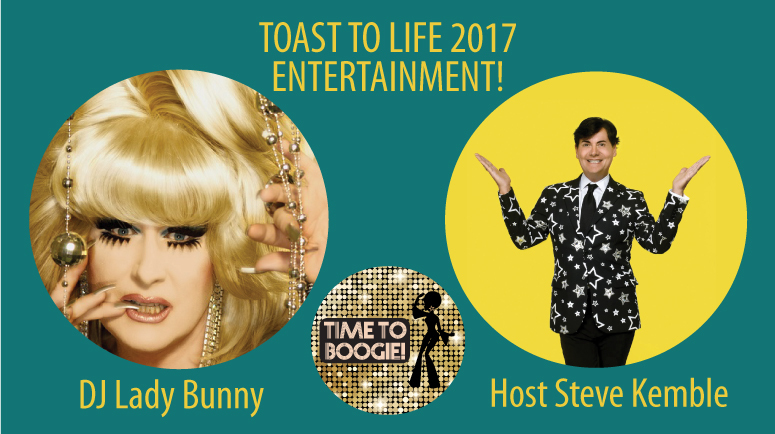 With her glitzy outfits, sky-high wigs and false eyelashes long enough to embarrass Tammy Faye Baker, multi-talented drag artist Lady Bunny will be the start attraction at this year's Toast To Life-Time To Boogie event on March 4. Bunny is a successful comedienne, DJ, actress, singer/songwriter and most famously, the emcee and creator of Wigstock, the outrageous drag festival of drag and music which electrified New Yorkers every Labor Day for over 20 years. Bunny has literally traveled the globe spinning atop the Eiffel Tower, Tokyo’s Mori Tower, the Fendi Showroom in Milan, London’s Harvey Nichols, The Delano in Miami and was the first DJ ever to spin at Paris’s palatial L’Opera Garnier. Bunny spins at fashion events, club events, corporate bashes, weddings and bar mitzvahs and her specialty is nailing what the crowd wants to hear. “When you DJ from Pride to Fashion Week in Paris to gay weddings to bar mitzvahs, you find out what a crowd likes,” she said. America's sassiest lifestyle guru, Steve Kemble, will be Toast To Life's host and emcee. 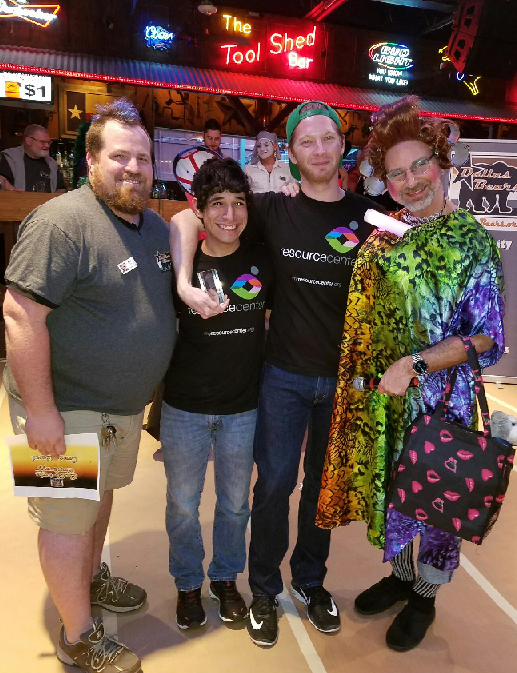 Steve has been the magic behind countless corporate events, weddings and other sassy ventures for more than two decades, throwing parties for everyone from President Obama to the Dallas Cowboys. The event industry's king of self-promotion is the industry’s most visible, vocal and unique personality. Steve has been dishing out fashion disses at celebrities for more than five years as a Top Cop for Us Weekly magazine's Fashion Police, on the red carpet at the Golden Globe Awards, American Music Awards and Independent Spirit Awards. You don't want to miss these two lively acts at Resource Center's party of the year, so grab your tickets now! Connect with Resource Center online. Resource Center, a United Way agency, operates the Community Center, Health Campus, Nelson-Tebedo Clinic, FUSE, Valor Latino, United Black Ellument and Youth First. For over 30 years, the Center has provided programs of interest to lesbian, gay, bisexual, and transgender (LGBT) community members and critical assistance to people living with HIV and AIDS and for their families. The programs of Resource Center promote understanding of the LGBT community and aim to eradicate the spread of HIV and AIDS. Copyright © | 2017 | RESOURCE CENTER | All rights reserved.